o ensure an efficient support of Proyecto Horizonte from our international supporters, we have implemented a network of partners. To handle donations in an effective manner and to provide the benefits of tax deductions to our donors we work with foundations in Germany and United States. The organizations are managed by volunteers and work either exclusively or very close with us. They are recognized charitable organizations in their countries, thus can provide confirmations about the donations which are recognized by the respective tax authorities. The only administrative expenses relate to third party handling fees of donations, such as bank and credit card fees. We also work with other organizations which help us collect donations, organize events or handle sales of artisan products. If you are based outside of Germany or the United States and would like to work with a locally based organization please let us know. There are no administration fees outside of Bolivia, therefore 100% of the donations received directly benefit the community. 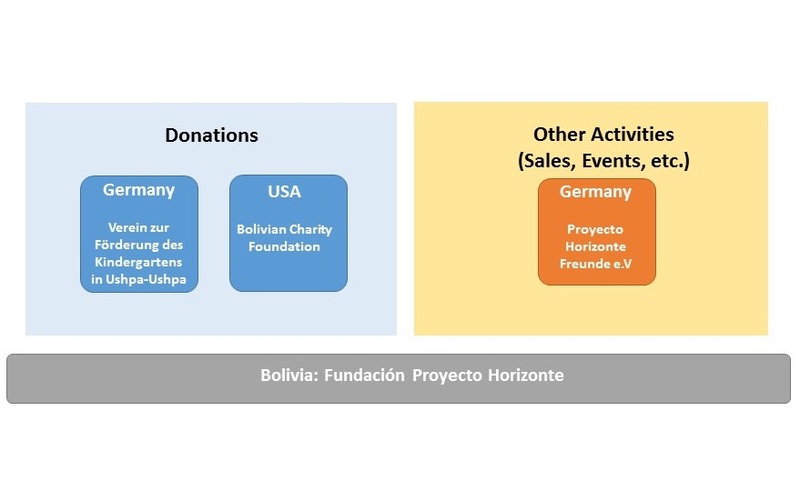 In the United States we work with the Bolivian Charity Foundation (BCF), an organisation that is registered as a 501 charity and receives donations for both Proyecto Horizonte and other small initiatives in Bolivia. Donations are then transferred to Bolivia. You can donate online through Network for Good which is an online donation tool that Bolivian Charity Foundation, Proyecto Horizonto’s partner, uses to enable paypal and credit card payments in a safe and easy way. Pressing the donate now button will take you to our registered page with Network for Good. The donors based in the United States will receive a donation tax receipt from Network for Good. If you are based outside of Germany and the United States, you have the choice to transfer funds to our aforementioned bank accounts in Germany or the United States or make a direct transfer to our Bolivian bank account.